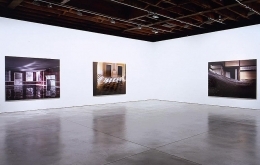 Sean Kelly Gallery is delighted to announce an exhibition of major new works by James Casebere. For the last twenty years James Casebere has constructed increasingly complex models that are subsequently photographed in his studio. Casebere's table-size constructions, based on architectural, art historical and cinematic sources are made of simple materials, pared down to essential forms, and frequently emptied of extraneous detail. Since 1992 his subject matter has focused on institutional spaces and the relationship between social control, societal structure and increasingly sophisticated levels of interpretation. 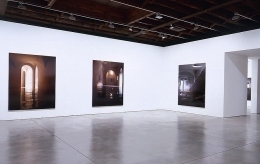 As Anthony Vidler Dean of The Cooper Union School of Architecture writes, "Casebere's "spatial unconscious" is in photographic representation, an opening through vision into the psychopathology of lived space, a space that blurs all the traditional distinctions between the space and the space represented". This exhibition of new work produced in the last two years is being premiered in New York at Sean Kelly Gallery. A wide range of iconic architectural spaces inspired these works. Casebere continues to investigate Colonial American, Neoclassical domestic spaces like Thomas Jefferson's Monticello. Models based on a Sienese palazzo and Islamic style Spanish baths demonstrate Casebere's interest in vernacular architectural styles of diverse worldwide origin. A group of photographs inspired by spare mid-century American Modernist domestic and commercial structures, both recall Casebere's earlier works of the 90s, and at the same time expand upon his fascination with recent architectural and social history. In these seemingly ambiguous pieces Casebere conceptually manipulates "the revelation of an implied future for architectural space, a space at once of our unconscious and our lived reality, that describes the fragile treaty between the two." Recent Casebere exhibitions have included a substantial one person show which originated at SECCA, Winston Salem, NC, and traveled to the Museum of Contemporary Art, Cleveland, OH; the Musée d'Art Contemporain, Montreal, Quebec, and the Indianapolis Museum of Art, Indianapolis, IN. James Casebere is represented in numerous public and private collections worldwide including the National Gallery of Canada, Ottawa; the Fonds National d'Art Contemporain, Paris, France; the Neue Galerie der Stadt, Linz, Austria; the Mukha Museum, Antwerp, Belgium; the Victoria and Albert Museum, London, England; the Tate Modern, London, England; the Museum of Modern Art, New York; the Solomon R. Guggenheim Museum, New York; the Metropolitan Museum of Art, New York and the Whitney Museum of American Art, New York. All works except Minka with Dirt and Fog are available in 48 x 60 inches (122 x 152 cm).